by Justin Madore The film industry has changed a lot since Marvel’s introduction of the modern cinematic universe. Sure, the idea of a cinematic universe had been done before (see the Universal Monsters Cinematic Universe, Alien vs. Predator and Freddy vs. Jason), but it hadn’t been done to the scale and quality that Marvel has raised it to. In recent years, the success of the MCU has had huge ramifications for the rest of the film industry. The Universal Monsters Cinematic Universe is being rebooted, a Godzilla/King Kong universe is on its way, and of course, now the DC Extended Universe is being introduced with the accurately double-titled, Batman v Superman: Dawn of Justice. Designed as a sequel to Man of Steel, but also meant to introduce a myriad of characters from the DC cannon and set-up a shared universe, a lot rides on the success of this film. Batman v Superman begins with a stale interpretation of Bruce Wayne’s (Ben Affleck) well-known childhood trauma. As if anyone watching isn’t familiar with Batman, we are once again shown a young Bruce falling down a well, being ambushed by bats in a cave, and seeing his parents get murdered in a grimy alleyway. The film then jumps to the climax of 2013’s Man of Steel, showing the destruction from Wayne’s point of view, as he watches Superman (Henry Cavill) and Zod (Michael Shannon) destroy Metropolis, killing thousands of people, including some friends of his. Thus, a hatred for Superman is sparked in him. A year and a half later, after another inciting incident, Bruce becomes hellbent on destroying Superman for the good of mankind. When the two eventually clash, the tension between them is palpable, and Snyder gives the battle the correct visual treatment to satisfy fans. Drawing from the characterization in Frank Miller’s The Dark Knight Returns, Ben Affleck defies the haters as what might be the best version of Batman yet. Dark, brooding, and incredibly violent, this iteration of Batman is more tortured than any we have yet to see on screen. Affleck is absolutely brutal in the role, snapping limbs, branding the chests of his enemies, and yes, literally mowing down bad guys with a machine gun. He’s an older Batman who’s gotten more reckless with age, and he has good reason for it. The character proves to be the best part of this film, hands down. 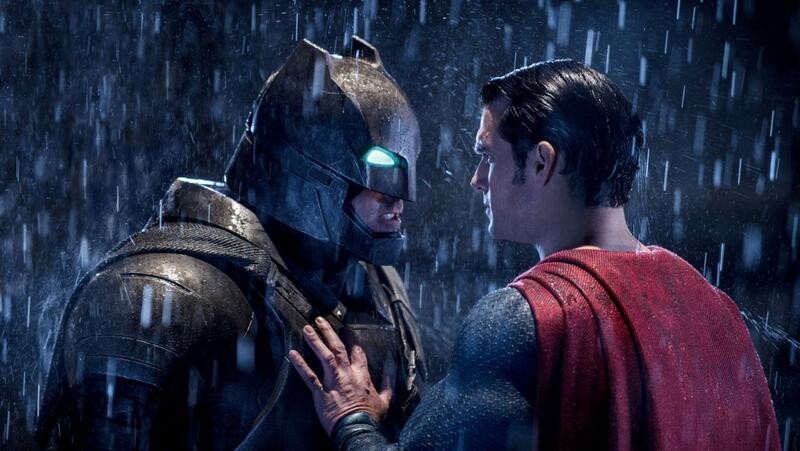 Opposite Affleck is Henry Cavill, who continues to do his best with what he’s given. Much of the film rests on him as the center of conflict. Should Superman be allowed to live among humans? Is he a danger to humanity? The world is obsessed with his status as a god among men, giving way for some really interesting imagery as people both worship and fear him. There are conflicting perspectives on the Man of Steel all around him, but the Man of Steel himself never really seems that conflicted. Cavill is still really stiff in the role, and it’s a problem. Even when the stakes are high and the tables are turned against him, there’s almost never a sign of struggle in his face. 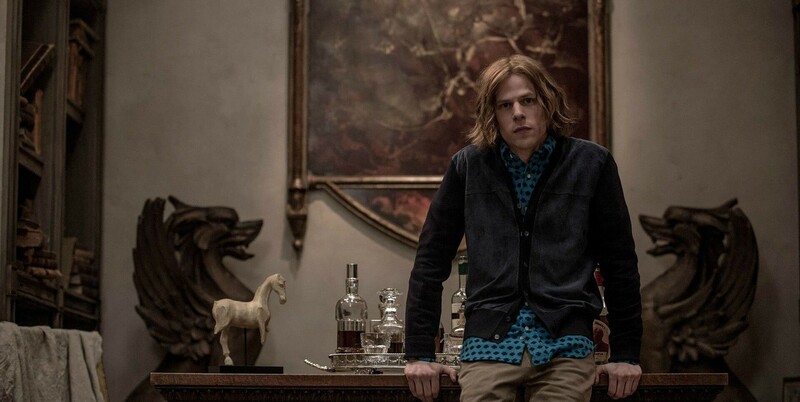 However, the worst performance of BvS is given by Jesse Eisenberg, who is just terrible as Lex Luthor. Sure, you could claim that it’s due to the writing, but Eisenberg in his stuttering, OCD, manic state of insanity never comes off as even a little bit intimidating or even dangerous. Eisenberg isn’t particularly large, and I’m not saying that villains have to be hulking brutes, but he’s just too small and mundane for the role. Without a sense of power, his spastic fits are more annoying than anything else. He’s a silly character in a film that takes itself very seriously, and he feels out of place. The rest of the character roster is bit of a mixed bag. Laurence Fishburne as Perry White talks in headlines for no reason, and Lois Lane (Amy Adams) continues to exist simply as a plot device meant to manipulate Superman. However, Jeremy Irons is a worthy successor to Michael Caine as Alfred and Gal Gadot certainly has the onscreen presence worthy of Wonder Woman (aka Diana Prince), although she feels shoe-horned into the script. Once her motives are revealed, you realize that the only reason she’s here is to introduce the character so people will see the Wonder Woman spinoff movie next year. Wonder Woman isn’t the only character that falls victim to this treatment. In fact, despite the movie being called Batman v Superman, it desperately tries to feel bigger than it should be. There are a number of shameless cameos by other characters in the DCEU that fail to serve the plot in any way, existing solely to introduce them for future films. Additionally, entire chunks of this movie are unrelated to the central conflict (the aforementioned scene involving Bruce’s parents, most if not all of Wonder Woman’s appearances, a few scenes involving a man injured by Superman during the battle of Metropolis) that clearly could’ve been siphoned off to cut the movie down to something more concise. The bloatedness is really what drags the film down. Coming in at a staggering 151 minutes, it’s still much too long for its core story, but much too short to develop the numerous subplots into something that makes sense. An adequate cut of this film would have to be four hours to adequately address each of the dangling story threads left unanswered. Instead, the film settles for an uncomfortable middle ground between these two extremes. It’s really too bad, because the central concept is really interesting. The problem is that it’s obviously mixed up in a corporate agenda, and the result is a film that feels like a series of filled out checkboxes. The finale isn’t even a fight between Batman and Superman, but between our trinity of heroes, and the Luthor-created monster, Doomsday. Despite Doomsday merely functioning as a foil to get Batman, Superman, and Wonder Woman to all fight something at the same time, there’s a tangible amount of energy and excitement when they unite. The destruction that ensues is both jaw dropping and head scratching. The visuals are stunning for the most part, as Snyder doesn’t overdo the glossy lens flares, relying instead on the scope of the battle to wow audiences, as large sections of city are swallowed by Doomsday’s kryptonic rage. Unfortunately, the logic of the fight makes it fall apart. As Doomsday gets hit more and more, he gets stronger. Completely baffled, I watched the characters acknowledge this truth, and then continue to attack Doomsday anyway. But the most frustrating part of BvS is the ending (the details of which I won’t spoil). It’s a complete cop-out and a terrible betrayal of the scenes preceding it. Regardless of all its problems, Batman v Superman: Dawn of Justice will probably be a financial success, and spawn all of the planned sequels that it sets up here. Concerning the film’s failures, much of the blame should fall on director Zack Snyder’s shoulders. However, it’s Warner Bros’ ambition for the franchise that is ultimately Batman v Superman’s greatest detriment. Dawn of Justice is an overlong, overstuffed mess filled with some interesting fight sequences, imagery and performances, hampered by a bad script, a terrible performance, some questionable editing and a whole lotta WTF logic.